They say time flies when you’re having fun! It’s hard to believe but deVine’s celebrates its 5th Anniversary with a huge drop-in festival style event this coming Saturday, May 1st from noon to 5pm. Featuring a multitude of premium wines, it will surely be a party atmosphere at the store, and as an added bonus, all wines tasted at this event will be 20% off. It is our way to saying thank you for your loyal patronage through another year. Tickets are $20 each and selling very quickly – you can check out some of the wines we’ll be pouring and also book in advance here. All of the deVine staff will be on hand to greet you, it may be a good time to talk to one of us about the upcoming 2009 Bordeaux futures offering, or chat about 2007 Californians, 2007 Vintage Ports, 2006 Super Tuscans..
Come Celebrate Edmonton Transit’s LRT Extension! Well, the long wait is finally over! deVine Wines and our neighbors on 104th-Street have been anxiously awaiting the opening of two new LRT stations. On Saturday, April 24, drop by the store and help us celebrate this proud civic achievement. We’ll pop some corks and offer everyone a glass of free sparkling wine between 11:00 AM to 5:00 PM. LRT expansion means connecting more Edmontonians to the downtown core. To visit us on 104th-Street, you are less than a twenty minute ride from the new Century Park Station and thirteen minutes away from the new Southgate Station. To reach us, your ride ends at the Bay/Enterprise Square Station. If you want to know what downtown Edmonton has to offer, start by visiting the Downtown Business Association’s website at www.edmontondowntown.com. To celebrate this event, ETS is hosting a Community Fair at both of the new stations. Please follow this link for complete details. Please note that the majority of events will take place at the Century Park Station. Free LRT service to the new stations does not begin until 11:00 AM. The Torres family surname has been linked with wine for more than three centuries, during which time their ancestors have worked vineyards in Penedès, a land with a millenarian tradition of wine. In 1979, further expansion into Curico in Chile was added to the portfolio and in 1989, the Marimar Torres Estate was started in Russian River featuring Chardonnay and Pinot Noir grape. Today, Torres exports to over 130 countries. 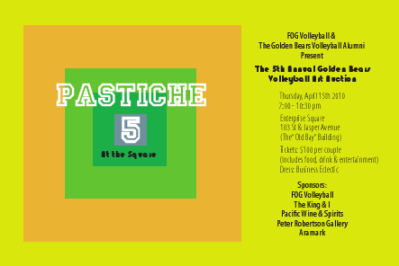 FOG Volleyball & the Golden Bears Volleyball Alumni present “PASTICHE 5”, the 5th Annual Golden Bears Art & Wine Auction. To be held at “Enterprise Square” (the Old Bay Building), the fundraiser is scheduled for Thursday, April 15th from 7-10:30pm. Combining Art and sport since 2006, this year’s event will feature the premier unveiling of Steven Csorba’s 2010 Olympic Collection along with over eighty pieces of outstanding artwork for auction. Some of the artists represent include Real Fournier, Graham Peacock, Jane Ash-Poitras, Allan Sapp, Jerry Whitehead, Manola, along with some of this year’s graduating class of the Fine Arts faculty from the Universiy of Alberta. Works ranging from $25 to $4500 will be up for auction. Food, wine and drinks provided by generous sponsors. Musical entertainment will be provided by a variety of artists including former National Volleyball team member Rod Walsh. Join us for a sizzling mixer of Art, Sport and Food & Drink! Tickets are $100 each admits two guests – contact Terry Danyluk at 780-492-1015 or by email at Terry.danyluk@ualberta.ca (deadline for tickets is April 12). Click here for the event pdf. 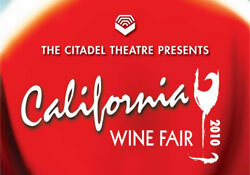 The 2010 California Wine Fair in support of the Citadel Theatre is fast upon us. Please join us again at the Shaw Conference Centre on Thursday, April 8, 2010 from 7pm to 9:30pm. This is a grand tasting featuring over 350 wines from one hundred wineries in the California winemaking region. Paired with delectable appetizers, this is a must for any California wine lover. As usual, a silent auction will be held, and for the first time this year, there will be a high-end silent auction table with many collectibles for bidding.